CD8+ T cells are a key focus of vaccine development efforts for HIV. However, there is no clear consensus as to which of the nine HIV proteins should be used for vaccination. The early proteins Tat, Rev, and Nef may be better CD8+ T cell targets than the late-expressed structural proteins Gag, Pol, and Env. In this study, we show that Gag-specific CD8+ T cells recognize infected CD4+ T lymphocytes as early as 2 h postinfection, before proviral DNA integration, viral protein synthesis, and Nef-mediated MHC class I down-regulation. Additionally, the number of Gag epitopes recognized by CD8+ T cells was significantly associated with lower viremia (p = 0.0017) in SIV-infected rhesus macaques. These results suggest that HIV vaccines should focus CD8+ T cell responses on Gag. Acquired immunodeficiency syndrome (AIDS) is still responsible for more deaths worldwide than any other infectious disease, underscoring the urgent need to find an effective vaccine. Unfortunately, traditional vaccine approaches have failed against HIV. Live attenuated vaccines risk pathogenicity (1) and attempts to induce effective neutralizing Abs have failed in phase III clinical trials (2, 3). Therefore, research efforts have focused recently on developing vaccine strategies that elicit effective CD8+ T cell responses (4). Ideally, such a CD8+ T cell vaccine would induce responses against conserved proteins expressed early during the replication cycle of the virus. The viral replication cycle concludes with the production of virus at ∼24 h postinfection (5). For optimal effectiveness, vaccine-induced CD8+ T cells should recognize infected cells early enough to prevent the release of progeny virus. Therefore, it has been suggested that CD8+ T cells which recognize epitopes derived from the early proteins Tat, Rev, and Nef might be more effective than CD8+ T cells directed against epitopes located in the late structural proteins Gag, Pol, and Env (6, 7, 8, 9, 10). The earlier an epitope is presented by MHC class I (MHC-I)3 molecules on the surface of an infected target cell, the more likely it is to serve as an effective target for CD8+ T cells. Furthermore, the viral protein Nef down-regulates MHC-I molecules after it is produced between 6 and 12 h postinfection (11, 12, 13). This could diminish the effectiveness of CD8+ T cells directed against proteins expressed later in the viral replication cycle. To address these possibilities, we assessed how soon after infection CD8+ T cells recognized epitopes derived from Tat, Gag, and Env on the surface of infected CD4+ T cells. Surprisingly, CD8+ T cells recognized Gag-derived epitopes by 2 h postinfection, before integration (14) and viral protein synthesis (13). Additionally, epitopes derived from Env did not appear until 18 h postinfection, close to the onset of progeny virus production. Thus, our data suggest that a CD8+ T cell-based HIV vaccine should stimulate responses against Gag, a highly conserved viral protein. Conversely, Env-specific CD8+ T cells may not be effective because epitopes derived from this highly variable glycoprotein are expressed too late in the viral replication cycle. The animals in this study were Indian rhesus macaques (Macaca mulatta) from the Wisconsin National Primate Research Center colony. They were typed for MHC-I alleles Mamu-A*01, Mamu-A*02, and Mamu-B*17 by sequence-specific PCR as described previously (15). The animals were cared for according to the regulations and guidelines of the University of Wisconsin Institutional Animal Care and Use Committee. Target cells were generated from freshly isolated PBMC obtained from SIV-naive Indian rhesus macaques using Ficoll-Paque PLUS (Amersham Biosciences) density centrifugation. CD4+ T cells were isolated using CD4 microbeads and LS columns purchased from Miltenyi Biotec and used according to the manufacturer’s instructions. Targets were activated by incubating overnight with staphylococcal enterotoxin B (SEB) (2.5 μg/ml) and Abs to CD28 (2.5 μg/ml), CD3 (2.5 μg/ml), and CD49d (2.5 μg/ml) and cultivated in the presence of IL-2 (100 U/ml). CD4+ targets were consistently ≥95% CD3 and CD4 positive. Virus-specific CD8+ T cell clones were generated as described previously (7). Briefly, three rounds of limiting dilution were performed on CD8-enriched PBMC from SIV-infected macaques with repeated stimulations of autologous B-lymphoblastoid cells pulsed with the peptide of interest. Purity of clones was verified by tetramer and/or intracellular cytokine staining (ICS). Cells were cultured in R15-100 (RPMI 1640 medium containing 15% FCS and 100 U/ml IL-2). IL-2 was obtained through the National Institutes of Health (NIH) AIDS Research and Reference Reagent Program. SIVmac239 was generated (16) and purified (17) as described previously. Briefly, Vero cells were transfected with plasmid DNA encoding proviral sequences. CEMx174 cells were added to the Vero cultures, and the virus was subsequently expanded on CEMx174 cells. Cell-free supernatant was collected 2 days after peak syncytium formation. The virus was subsequently purified through a 20% sucrose cushion immediately before use in the kinetic ICS (KICS) assay. ViroMag beads were obtained from OZ Biosciences. SIVmac239 was magnetized with ViroMag beads and cells synchronously infected according to the manufacturer’s instructions with a multiplicity of infection ≤1. Briefly, target cells were incubated with the magnetized virus for 15 min in the presence of a magnetic field, washed once in PBS, washed once with 0.25 μg/ml trypsin EDTA (Sigma-Aldrich), and then washed twice with PBS. Infected targets were then incubated in R15-100 (RPMI 1640 medium containing 15% FCS and 100 U/ml IL-2). AT-2 inactivated SIVmac239 was a gift from J. Lifson (AIDS Vaccine Program, SAIC-Frederick) and was produced from infected SUPT1-CCR Cl 30 cells essentially as described (18). Cells treated with tenofovir were incubated with 400 μM tenofovir for at least 2 h before infection and throughout the experiment. Tenofovir disoproxil fumarate was obtained through the NIH AIDS Research and Reference Reagent Program. A total of 1 × 105 synchronously infected CD4+ T lymphocytes was infected as described above and cocultured with CD8+ T cell clones at an E:T ratio of 1:1 in ∼150 μl of R15-100 at 37°C. At the specific time points, the wells were harvested and stained for the expression of CD4 and CD8, followed by ICS staining of Gag p27 using Fix and Perm (Caltag Laboratories) according to the manufacturer’s protocol with fluorescently conjugated 55-2F12 Gag p27 Ab (NIH AIDS Research and Reference Reagent Program) at ∼0.75 mg/ml. CD4 and CD8 Abs were purchased from BD Biosciences. CD8+ T cell clones used in this assay responded similarly to B-lymphoblastoid cells pulsed with cognate Ag and suppressed viral replication in a longer 7-day viral suppression assay (19). Based on our past experience in analyzing viral load data, we expected the data to be markedly non-normally distributed, heteroscedastic, and to be restorable to approximate normality and approximate homoscedasticity via a log transformation. In the current data set, we found exactly the same thing. Therefore, the data were transformed via log (base 10) transformation. After transformation, we conducted independent group Student’s t tests to evaluate whether there were statistically significant differences in mean viral loads for several comparisons. In each case, we also continued to evaluate the data for any potential heteroscedasticity and, if such heteroscedasticity was observed, used the Welch-corrected t test to calculate p values evaluating the significance of differences in group means. For Gag responses, there was no evidence of heteroscedasticity across the groups. For Env there was a marginally statistically significant difference in variances (p = 0.0478). In this case, either with or without using the Welch-corrected t test for heterogeneity of variance, there was no statistically significant difference between the means (p = 0.7416) for the Welch-corrected t test. For Gag, there was a statistically significant difference between the means in terms of viral loads (p = 0.0017). PBMC were used directly in IFN-γ ELISPOT assays as described previously (4). Briefly, 15-mer peptides from Gag or Env were added to 1 × 105 PBMC per well and incubated for 16–18 h at 37°C in a 5% CO2 incubator. All tests were performed in duplicate. Wells were imaged with an ELISPOT reader (Autoimmun-Diagnostika), counted by ELISPOT Reader, version 3.1.1 (Autoimmun-Diagnostika), and analyzed as described previously (4). A response was considered positive if the mean number of spot-forming cells of duplicate sample wells exceeded background plus two SD and was >50 spot-forming cells per 1 × 106 cells. The ICS assay was performed as described previously (4) with some modification. Briefly, 1 × 105 synchronously infected CD4+ targets were incubated with 1 × 105 SIV-specific CD8+ clones for 1.5 h at 37°C in 200 μl of R15–100 (RPMI 1640 medium containing 15% FCS and 100 U/ml IL-2) with anti-CD28 and anti-CD49d. To prevent protein transport from the Golgi apparatus, 10 μg of brefeldin A (BFA) per ml was added at the specific time points postinfection indicated and the cells were incubated an additional 5 h at 37°C. Cells were washed and stained for surface expression of CD4 and CD8 markers and fixed overnight in 1% paraformaldehyde at 4°C. The following day, cells were permeabilized in buffer containing 0.1% saponin and stained for IFN-γ and TNF-α before being fixed in 1% paraformaldehyde for 2 h at 4°C. Events were collected on a FACSCalibur flow cytometer (BD Biosciences) with CellQuest software (BD Biosciences) and analyzed with FlowJo v.6.1.1 or above for Macintosh (Tree Star). A positive result is defined as being at least 2-fold higher than the negative control, preferably with the mean fluorescent intensity at least in the second decade above the negative peak. To determine when SIV-derived epitopes are first presented to CD8+ T cells by MHC-I molecules on the surface of target cells, we developed a novel KICS assay. This assay uses primary CD4+ T lymphocyte targets, SIV-specific CD8+ T cell clones, and a synchronized infection with SIVmac239 (Fig. 1⇓). We stimulated freshly isolated CD4+ T lymphocytes overnight with SEB and costimulatory Abs and then infected these cells with magnetized SIVmac239 in the presence of a magnetic field for fifteen minutes to synchronize adsorption (20). At various time points after infection, we treated the CD4+ T lymphocytes with the Golgi transport inhibitor BFA to block the transport of epitope-loaded MHC-I molecules to the cell surface. To measure epitope presentation, we incubated the synchronously infected CD4+ T lymphocytes with SIV-specific CD8+ T cell clones and detected recognition of MHC-I-bound epitopes by the secretion of the cytokines IFN-γ and TNF-α from the CD8+ T cells. KICS assay schematic. A, PBMC-derived CD4+ T cell targets were activated by overnight stimulation with SEB and CD28, CD3, and CD49d Abs. B, Effector cells were generated by three rounds of limiting dilution of a 2-wk in vitro-stimulated CD8+ T cell line. 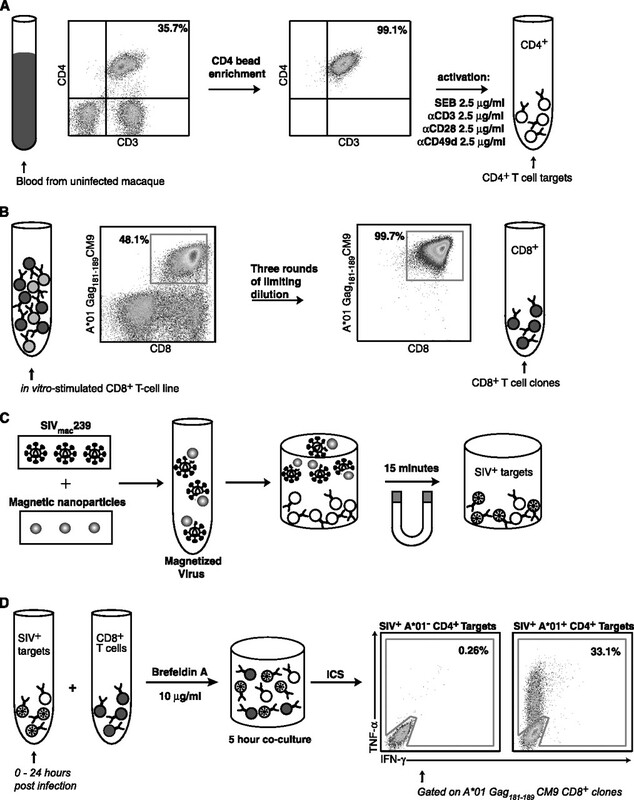 C, Activated CD4+ target cells are synchronously infected by a 15-min incubation with magnetically activated SIVmac239 (multiplicity of infection ≤1) in the presence of a magnetic field. Spinoculation (41 ) was used to verify the results of some experiments. Identical results were obtained with both methods (data not shown). D, Synchronously infected CD4+ target cells are cocultured with SIV-specific clones for 1.5 h and then for an additional 5 h in the presence of BFA at various times postinfection. ICS is then performed to detect activation of the CD8+ T cell clones via staining for IFN-γ and TNF-α. We initially hypothesized that CD8+ T cells would recognize epitopes derived from the regulatory protein Tat early in the replication cycle. By contrast, we predicted that CD8+ T cells directed against epitopes in the structural proteins Gag and Env, which are expressed later, would recognize infected cells after 18 h of infection. Using CD8+ T cell clones specific for Gag, Tat, and Env (Table I⇓), we examined the kinetics of epitope presentation over the complete 24-h time course of the viral life cycle. Gag-specific clones did indeed recognize infected targets late in the viral replication cycle, between 18 and 24 h postinfection (Fig. 2⇓, A and B). Tat-specific clones recognized infected targets by 12 h postinfection (Fig. 2⇓C). Surprisingly, however, we saw MHC-I-restricted recognition of the Gag-derived epitopes at 6 h postinfection, when no Env- or Tat-derived epitopes were detectable on the surface of virus-infected cells (Fig. 2⇓). 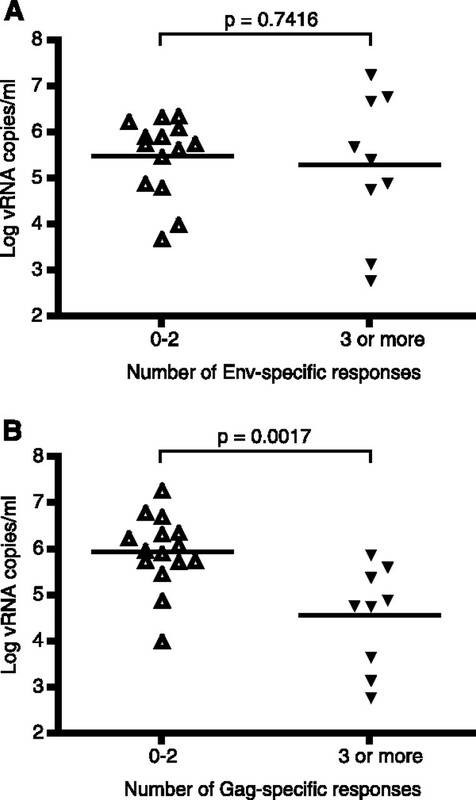 In contrast, CD8+ T cells did not recognize Env-derived epitopes until late in the viral replication cycle, between 18 and 24 h postinfection (Fig. 2⇓D). We saw no recognition of uninfected MHC-I-matched or infected MHC-I-mismatched CD4+ T lymphocytes at any point during the replication cycle, indicating that cytokine secretion was both peptide specific and MHC-I restricted (Fig. 2⇓). Presentation kinetics of SIV-derived CD8+ T cell epitopes. MHC-I-matched (▪) and MHC-I-mismatched (large asterisk) CD4+ T cell targets were synchronously infected with SIVmac239 and cocultured at an E:T of 1:1 with SIV-specific CD8+ T cell clones specific for Gag CM9 (A), Gag GY9 (B), Tat SL8 (C), or Env FW9 (D). Results are shown as a percentage of the maximum cytokine staining of TNF-α and IFN-γ detected during the assay. Representative raw flow data is shown in Fig. 1⇑D. Uninfected, MHC-I-matched targets did not activate the CD8+ T cell clones (data not shown). Data shown are mean ± SD for at least three independent experiments. Because it appeared that Gag-specific CD8+ T cells could already recognize infected cells by 6 h, we next explored even earlier events in the time course of epitope presentation. Two different Gag-specific CD8+ T cell clones restricted by two different MHC-I molecules recognized their cognate epitopes as early as 2 h postinfection, with recognition peaking at ∼6 h postinfection (Fig. 3⇓, A and B). By contrast, CD8+ T cell clones directed against epitopes in Env and Tat failed to recognize infected cells during the first 7 h of infection, although they recognized the same infected cells at 24 h postinfection (Fig. 3⇓, C and D, and data not shown). As before, infected MHC-I-mismatched targets failed to activate CD8+ T cells. Additionally, this early Gag presentation occurred in the context of two different MHC-I molecules and with two different Gag proteins, Gag p27 and p17. Gag-specific CD8+ T cells recognize infected cells by 2 h postinfection. Synchronously infected MHC-I-matched (▪) and MHC-I-mismatched (large asterisk) CD4+ T cell targets were cocultured at an E:T of 1:1 with SIV-specific CD8+ T cell clones specific for Gag CM9 (A), Gag GY9 (B), Tat SL8 (C), or Env FW9 (D). Results are shown as a percentage of the maximum cytokine secretion detected during the assay. For Tat- and Env-specific CD8+ T cells, the infected targets used for the first 7 h were used as APCs at 24 h postinfection to obtain maximum responses. Data shown are mean ± SD for at least three independent experiments. Virion-derived Gag and Env proteins have very different fates after infection. Env proteins remain on the cell surface, (13), while the viral genome is delivered into the cell in a ribonucleoprotein complex composed largely of Gag. Therefore, we reasoned that CD8+ T cells specific for Gag might recognize infected cells early after infection because the infected cells were presenting epitopes derived from the incoming, virion-derived Gag protein. If this hypothesis were correct, early recognition of Gag-derived epitopes would not require gene expression or even infectious virus, because virion-derived Gag would be sufficient to trigger CD8+ T cells. Indeed, pulsing target cells with noninfectious, 2,2-dithiodipyoidine (aldrithiol-2)-inactivated virus or treatment of infected cells with the reverse transcriptase inhibitor, tenofovir, elicited responses from Gag-specific CD8+ T cells that peaked at 6 h postinfection and then decayed over time (Fig. 4⇓, A and B). Using flow cytometry, we did not detect synthesis of the viral proteins Nef or Gag in cells treated with tenofovir or pulsed with AT-2-inactivated virus, indicating viral protein synthesis was not occurring (data not shown). Although de novo viral protein synthesis of Gag was blocked, early recognition of Gag-derived epitopes was unaltered. Additionally, pulsing with AT-2-inactivated virus or treating infected cells with tenofovir abolished the later wave of biphasic Gag presentation, indicating that early Gag recognition was due to epitopes derived from the incoming virus. The second wave, beginning at ∼18 h postinfection, was therefore likely dependent upon de novo Gag synthesis. Although early Gag-specific recognition still occurred in the absence of protein synthesis, Tat- and Env-specific recognition were completely abrogated by these two treatments (Fig. 4⇓, C and D). Thus, CD8+ T cells specific for these two proteins recognized infected cells after de novo synthesis of the protein containing their cognate epitope. Early presentation of Gag-derived CD8+ T cell epitopes does not require de novo protein synthesis. CD4+ T cell targets (▪) were infected with equal amounts of virus, as measured by Gag p27 content, of either AT2-inactivated SIVmac239 or infectious SIVmac239 in the presence of 400 μM Tenofovir to inhibit reverse transcription and then cocultured with CD8+ T cells specific for Gag CM9 (A), Gag GY9 (B), Tat SL8 (C), or Env FW9 (D). Cells infected with infectious SIVmac239 were pretreated with 400 μM Tenofovir for at least 2 h before infection and cultured with 400 μM tenofovir throughout the experiment to block reverse transcription and the KICS assay was performed as described. Data shown are mean ± SD for at least three independent experiments. To investigate further the presentation of Gag epitopes derived from incoming virions, we performed a dose-response analysis of the virus inoculum. Increasing the input amounts of infecting virus correlated with increased recognition of the infected CD4+ T lymphocytes by Gag-specific CD8+ T cells. Cells exposed to as little as 3–15 femtograms of Gag p27 per cell, corresponding to ∼20–100 virions per cell, stimulated Gag-specific CD8+ T cells at 6 h postinfection (Fig. 5⇓). This threshold is likely attained in vivo, especially in immune tissue compartments where there are concentrated, local bursts of infection (21). Titration of virus inoculum. Gag CM9-specific (A) or Gag GY9-specific (B) CD8+ T cell clones were cocultured with CD4+ T cell targets synchronously infected with decreasing amounts of virus, as measured by Gag p27 content, at an E:T of 1:1 (at 6 h postinfection). Positive results are underlined. Dot plots were generated by gating on live lymphocytes and CD8+ T cells, and results are shown as percentages of IFN-γ+ and/or TNF-α+ CD8+ T cells. Results are representative of at least two independent experiments. Our previous assays measured cytokine secretion, but did not address the ability of Gag-specific CD8+ T cells to eliminate newly infected CD4+ T cells. Therefore, we next investigated the ability of Gag-specific CD8+ T cells to reduce the proportion of Gag p27 staining in infected CD4+ T lymphocytes. To measure elimination of infected cells, we monitored intracellular Gag p27 frequency throughout the viral replication cycle after a synchronized infection. Immediately following infection, we detected Gag p27 in infected cells (Fig. 6⇓A). This was consistent with our observation that virion-derived Gag is present in recently infected cells. At 18 h postinfection, after production of the viral protein Nef, which down-regulates MHC-I and CD4 (22), we detected Gag p27 in CD4+ and CD4− cells. Finally, by 24 h postinfection, two distinct infected populations were apparent: CD4+Gag p27+ cells and CD4−Gag p27+ cells. The CD4+Gag p27+ cells are likely newly infected cells where viral protein synthesis has not occurred. The CD4−Gag p27+ cells are infected cells, in which the provirus has integrated and produced viral proteins. Gag-specific CD8+ T cells eliminate infected cells early after infection. A Mamu-A*01+, Mamu-A*02+, and Mamu-B*17+ CD4+ target cell line was synchronously infected and cocultured at an E:T of 1:1 with either no CD8+ T cells (A), or with SIV-specific CD8+ T cell clones specific for Gag GY9 (B), Tat SL8 (C), or Env FW9 (D). E, To ensure that elimination of infected cells was MHC-I-dependent, a Mamu-A*01−, Mamu-A*02−, and Mamu-B*17− CD4+ target cell line was synchronously infected and cocultured for 24 h with the CD8+ T cell clones described above. Dot plots were generated by gating on live, CD8− cells. Data are representative of three independent experiments. The Gag-specific clone, Gag71–79GY9, eliminated many of the infected cells by 6 h postinfection, reducing the frequency of Gag p27+CD4+ T cells at 6 h postinfection from 66% (no CD8+ T cell control) to 34.6% (Fig. 6⇑B). Reduction of Gag p27+ CD4+ T cells continued throughout the course of the experiment (Fig. 6⇑, A and B). In contrast, elimination of infected cells by Tat- or Env-specific CD8+ T cell clones was delayed, first occurring at 18 h postinfection (Fig. 6⇑, C and D). When infected cells were cocultured with Tat- or Env-specific clones, there was a diminution of Gag p27 staining only in the CD4− cells. This agrees with our previous observation that CD8+ T cells specific for these proteins cannot recognize infected cells until proviral integration (14) and viral protein synthesis (13) has already occurred. Conversely, Gag-specific CD8+ T cells reduced the frequency of Gag p27 in both the CD4+ and CD4− populations, indicating that Gag-specific CD8+ T cells could recognize and eliminate SIV-infected cells both before and after proviral integration (14) and viral protein synthesis (13). Finally, the frequency of Gag p27+ MHC-I-mismatched targets was unchanged (Fig. 6⇑E), demonstrating that the CD8+ T cell clones were only responding to infected cells in an MHC-I-restricted manner. To determine whether early recognition of Gag epitopes might have an impact on CD8+ T cell efficacy in vivo, we studied the cellular immune responses and viral loads of 24 unvaccinated Indian rhesus macaques. These animals were all infected with the molecularly cloned virus, SIVmac239. During the postacute phase, 6–32 wk postinfection, viral loads were monitored by quantitative RT-PCR. CD8+ T cell responses against Gag and Env were measured in IFN-γ ELISPOT assays using overlapping 15 mers spanning the entire length of the Gag and Env proteins. We observed no correlation between Env-specific responses and lower viral loads in the postacute phase (p = 0.74) (Fig. 7⇓A). In contrast, a reduction of viremia was significantly associated with multiple CD8+ T cell responses directed against Gag. Animals with three or more responses to Gag had set-point viremia nearly one and a half logs lower than animals with fewer responses (p = 0.0017) (Fig. 7⇓B). These findings agree with a similar study performed with a large cohort of unvaccinated HIV-infected individuals in South Africa (23). Finally, due to a paucity of CD8+ T cell responses in Tat, Rev, and Nef, it was not possible to perform the analysis using these proteins. Multiple Gag-specific, not Env-specific, CD8+ T cell responses are linked with lower viremia in SIVmac239-infected macaques. Distribution of viral loads of 24 unvaccinated, SIV-infected rhesus macaques during the postacute phase according to number of responses (▵, zero to two responses, ▾, three or more responses) against the entire length of Env (A) or Gag (B). Values of p were generated through independent group Student’s t tests (n = 24). In this study, we show for the first time that SIV-infected CD4+ T lymphocytes present Gag-derived CD8+ T cell epitopes early after infection. We detected presentation by 2 h postinfection, before proviral DNA integration (14) or viral protein synthesis (13). These epitopes were therefore likely derived from the incoming virus inoculum. Furthermore, we correlated the ability to mount multiple Gag-specific CD8+ T cell responses with reduction of chronic phase viremia. Gag-specific CD8+ T cells may be more important in controlling viral replication than previously thought. This might be due to the early presentation of Gag-derived epitopes. Although it is possible that our in vitro assays used more infectious SIV than would be available during infection in vivo, the virus titration experiment performed argues against this. The dose-response analysis of the virus inoculum revealed a CD8+ T cell triggering threshold in the range of 20–100 virions per cell. One infected cell produces between 100 and 1,000 virus particles per day (24, 25), and only ∼1 in 10,000 virus particles is infectious (26, 27). It is therefore likely that an uninfected CD4+ T cell located in close proximity to an infected cell in an immune tissue compartment could be infected by sufficient virus to exceed the threshold required to trigger a Gag-specific CD8+ T cell. Our observation that virion-derived epitopes are presented on the cell surface within 2 h of infection is consistent with other studies in which epitopes arrived at the plasma membrane in the context of MHC-I molecules within 1 h of introduction into the cytosol (28). Presentation of CD8+ T cell epitopes derived from the incoming virion has been shown previously with other viruses, including adenovirus (29), influenza virus (30), and cytomegalovirus (31). This phenomenon is not, therefore, unique to retroviruses, but rather a consequence of viral protein penetration into the cytosol where it is accessible to cellular Ag processing machinery. Indeed, the proteosome has previously been shown to degrade Gag from incoming HIV virions early in the replication cycle (32) and plays a major role in generating antigenic peptides presented by MHC-I molecules. Therefore, it is likely that the proteosome is directly involved in the early presentation from virion-derived Gag after infection. With >1500 copies of Gag p27 per virion (33), the incoming virus inoculum provides abundant substrate for the Ag processing machinery. Furthermore, CD8+ T cells can recognize even a few cell surface peptide/MHC-I complexes (34) and an effectively recognized epitope from HIV-1 is presented at an average density of 14 copies per cell (35). Early presentation of Gag-derived epitopes did not require de novo protein synthesis. Cells treated with the reverse transcriptase inhibitor tenofovir still efficiently triggered Gag-specific CD8+ T cells early after infection in the absence of detectable viral protein synthesis. Furthermore, cells exposed to AT-2-inactivated SIV virions, whose infectivity has been destroyed without affecting their Env-mediated fusion ability (36), also triggered Gag-specific CD8+ T cells early after infection. These data confirm that the Gag epitopes were derived from incoming virions. Our data suggest that Env may not be a good target for vaccines designed to induce CD8+ T cell responses. Env proteins from the incoming virus remain associated with the plasma membrane (13) and are not accessible to the Ag-processing machinery. Env-specific CD8+ T cells therefore cannot recognize infected cells until de novo protein synthesis of the Env protein occurs, rather late in the replication cycle. As a consequence, Env-specific CD8+ T cells cannot recognize or eliminate infected cells until well after Nef-mediated down-regulation of MHC-I molecules (11, 12, 13) has occurred and close to the onset of progeny virus production. This tardy recognition and the variable nature of Env suggest that it would be a poor viral protein for a vaccine target to induce cellular immune responses. Our in vitro data provide a potential mechanism to explain the in vivo finding that there is an enhanced control of viral replication associated with multiple Gag-specific responses. This might be due to infected cells presenting Gag-derived CD8+ T cell epitopes early after viral entry. It is tempting to speculate that the kinetic advantage gained by Gag- over Env-specific CD8+ T cells is a key contributing factor for this disparity in vivo. However, other factors such as the facility with which the Env protein can escape from CD8+ T cell responses and the high cost of Gag escape on viral fitness (16, 37) likely also contribute significantly to this observation. Our data suggest that multiple Gag-specific responses are important in the control of SIV replication. Gag has already been used in vaccine regimens with variable results. Adenovirus-delivered Gag induced responses that suppressed replication of the artificial SHIV89.6p challenge virus (38), but failed to affect disease course after the more realistic SIVmac239 challenge (39). Interestingly, however, Mamu-A*01+ macaques vaccinated with adenovirus expressing Gag exerted transient control of SIVmac239 replication. These macaques all mounted a strong CD8+ T cell response against the immunodominant epitope Gag181–189CM9. Similar experiments using a vaccine regimen using Sendai virus expressing Gag resulted in MHC-I-dependent control of viral replication in five of eight vacinees (40). Therefore, it is possible that a broad CD8+ T cell response against several epitopes in Gag might be more efficacious. Gag-specific CD8+ T cells recognize infected cells by 2 h postinfection. After 6 h of infection, Gag-specific CD8+ T cells eliminate infected cells, both before and after proviral DNA integration (14) and viral protein synthesis (13). These findings demonstrate that Gag-specific CD8+ T cells do not require productive infection of cells or even de novo protein synthesis to recognize cells as infected and eliminate them. This raises the possibility that Gag-specific CD8+ T cells could be far more efficient than previously thought. We acknowledge Jonathan Yewdell for insightful discussion and helpful advice. We thank Andrea Weiler, Kim Weisgrau, Jason Reed, Shari Piaskowski, and Jessica Furlott for immunological assay assistance. J.B.S. thanks Louise Sacha for ongoing support. ↵1 This work was supported by National Institutes of Health Grants R01AI052056 and R01AI049120 (to D.I.W.) and in part with federal funds from the National Cancer Institute, National Institutes of Health, under contract N01-CO-12400. This publication was also made possible in part by National Institutes of Health Grant P51RR000167 awarded to the Wisconsin National Primate Research Center. This research was conducted in part at a facility constructed with support from Research Facilities Improvement Program Grants RR15459-01 and RR020141-01. ↵3 Abbreviations used in this paper: MHC-I, MHC class I; SEB, staphylococcal enterotoxin B; BFA, brefeldin A; ICS, intracellular cytokine staining; KICS, kinetic ICS. Baba, T. W., V. Liska, A. H. Khimani, N. B. Ray, P. J. Dailey, D. Penninck, R. Bronson, M. F. Greene, H. M. McClure, L. N. Martin, R. M. Ruprecht. 1999. Live attenuated, multiply deleted simian immunodeficiency virus causes AIDS in infant and adult macaques. Nat. Med. 5: 194-203. VaxGen. 2003. VaxGen Announces Results of its Phase III HIV Vaccine Trial in Thailand: Vaccine Fails to Meet Endpoints VaxGen, Brisbane. Burton, D. R., R. C. Desrosiers, R. W. Doms, W. C. Koff, P. D. Kwong, J. P. Moore, G. J. Nabel, J. Sodroski, I. A. Wilson, R. T. Wyatt. 2004. HIV vaccine design and the neutralizing antibody problem. Nat. Immunol. 5: 233-236. Wilson, N. A., J. Reed, G. S. Napoe, S. Piaskowski, A. Szymanski, J. Furlott, E. J. Gonzalez, L. J. Yant, N. J. Maness, G. E. May, et al 2006. Vaccine-induced cellular immune responses reduce plasma viral concentrations after repeated low-dose challenge with pathogenic simian immunodeficiency virus SIVmac239. J. Virol. 80: 5875-5885. Kim, S. Y., R. Byrn, J. Groopman, D. Baltimore. 1989. Temporal aspects of DNA and RNA synthesis during human immunodeficiency virus infection: evidence for differential gene expression. J. Virol. 63: 3708-3713. Loffredo, J. T., E. G. Rakasz, J. P. Giraldo, S. P. Spencer, K. K. Grafton, S. R. Martin, G. Napoe, L. J. Yant, N. A. Wilson, D. I. Watkins. 2005. Tat(28-35)SL8-specific CD8+ T lymphocytes are more effective than Gag(181-189)CM9-specific CD8+ T lymphocytes at suppressing simian immunodeficiency virus replication in a functional in vitro assay. J. Virol. 79: 14986-14991. Yang, O. O., P. T. Sarkis, A. Trocha, S. A. Kalams, R. P. Johnson, B. D. Walker. 2003. Impacts of avidity and specificity on the antiviral efficiency of HIV-1-specific CTL. J. Immunol. 171: 3718-3724. Van Baalen, C. A., M. Schutten, R. C. Huisman, P. H. Boers, R. A. Gruters, A. D. Osterhaus. 1998. Kinetics of antiviral activity by human immunodeficiency virus type 1-specific cytotoxic T lymphocytes (CTL) and rapid selection of CTL escape virus in vitro. J. Virol. 72: 6851-6857.
van Baalen, C. A., C. Guillon, M. van Baalen, E. J. Verschuren, P. H. Boers, A. D. Osterhaus, R. A. Gruters. 2002. Impact of antigen expression kinetics on the effectiveness of HIV-specific cytotoxic T lymphocytes. Eur. J. Immunol. 32: 2644-2652. Gallimore, A., M. Cranage, N. Cook, N. Almond, J. Bootman, E. Rud, P. Silvera, M. Dennis, T. Corcoran, J. Stott, et al 1995. Early suppression of SIV replication by CD8+ nef-specific cytotoxic T cells in vaccinated macaques. Nat. Med. 1: 1167-1173. Schwartz, O., V. Marechal, S. Le Gall, F. Lemonnier, J. M. Heard. 1996. Endocytosis of major histocompatibility complex class I molecules is induced by the HIV-1 Nef protein. Nat. Med. 2: 338-342. Collins, K. L., B. K. Chen, S. A. Kalams, B. D. Walker, D. Baltimore. 1998. HIV-1 Nef protein protects infected primary cells against killing by cytotoxic T lymphocytes. Nature 391: 397-401. Ranki, A., A. Lagerstedt, V. Ovod, E. Aavik, K. J. Krohn. 1994. Expression kinetics and subcellular localization of HIV-1 regulatory proteins Nef, Tat and Rev in acutely and chronically infected lymphoid cell lines. Arch. Virol. 139: 365-378. Brussel, A., P. Sonigo. 2003. Analysis of early human immunodeficiency virus type 1 DNA synthesis by use of a new sensitive assay for quantifying integrated provirus. J. Virol. 77: 10119-10124. Loffredo, J. T., J. Sidney, S. Piaskowski, A. Szymanski, J. Furlott, R. Rudersdorf, J. Reed, B. Peters, H. D. Hickman-Miller, W. Bardet, et al 2005. The high frequency Indian rhesus macaque MHC class I molecule, Mamu-B*01, does not appear to be involved in CD8+ T lymphocyte responses to SIVmac239. J. Immunol. 175: 5986-5997. Friedrich, T. C., E. J. Dodds, L. J. Yant, L. Vojnov, R. Rudersdorf, C. Cullen, D. T. Evans, R. C. Desrosiers, B. R. Mothe, J. Sidney, et al 2004. Reversion of CTL escape-variant immunodeficiency viruses in vivo. Nat. Med. 10: 275-281. Roos, J. W., M. F. Maughan, Z. Liao, J. E. Hildreth, J. E. Clements. 2000. LuSIV cells: a reporter cell line for the detection and quantitation of a single cycle of HIV and SIV replication. Virology 273: 307-315. Lifson, J. D., J. L. Rossio, M. Piatak, Jr, J. Bess, Jr, E. Chertova, D. K. Schneider, V. J. Coalter, B. Poore, R. F. Kiser, R. J. Imming, et al 2004. Evaluation of the safety, immunogenicity, and protective efficacy of whole inactivated simian immunodeficiency virus (SIV) vaccines with conformationally and functionally intact envelope glycoproteins. AIDS Res. Hum. Retroviruses 20: 772-787. Chung, C., W. Lee, J. T. Loffredo, B. Burwitz, T. C. Friedrich, J. P. Giraldo Vela, G. Napoe, E. G. Rakasz, N. A. Wilson, D. B. Allison, D. I. Watkins. 2006. Not all cytokine-producing CD8+ T-cells suppress simian immunodeficiency virus replication. J. Virol. 81: 1517-1523. Haim, H., I. Steiner, A. Panet. 2005. Synchronized infection of cell cultures by magnetically controlled virus. J. Virol. 79: 622-625. Grossman, Z., M. Meier-Schellersheim, W. E. Paul, L. J. Picker. 2006. Pathogenesis of HIV infection: what the virus spares is as important as what it destroys. Nat. Med. 12: 289-295. Swigut, T., L. Alexander, J. Morgan, J. Lifson, K. G. Mansfield, S. Lang, R. P. Johnson, J. Skowronski, R. Desrosiers. 2004. Impact of Nef-mediated downregulation of major histocompatibility complex class I on immune response to simian immunodeficiency virus. J. Virol. 78: 13335-13344. Kiepiela, P., K. Ngumbela, C. Thobakgale, D. Ramduth, I. Honeyborne, E. Moodley, S. Reddy, C. de Pierres, Z. Mncube, N. Mkhwanazi, et al 2007. CD8+ T-cell responses to different HIV proteins have discordant associations with viral load. Nat. Med. 13: 46-53. Rosok, B., J. E. Brinchmann, P. Voltersvik, J. Olofsson, L. Bostad, B. Asjo. 1997. Correlates of latent and productive HIV type-1 infection in tonsillar CD4+ T cells. Proc. Natl. Acad. Sci. USA 94: 9332-9336. Dimitrov, D. S., R. L. Willey, H. Sato, L. J. Chang, R. Blumenthal, M. A. Martin. 1993. Quantitation of human immunodeficiency virus type 1 infection kinetics. J. Virol. 67: 2182-2190. Piatak, M., Jr, M. S. Saag, L. C. Yang, S. J. Clark, J. C. Kappes, K. C. Luk, B. H. Hahn, G. M. Shaw, J. D. Lifson. 1993. High levels of HIV-1 in plasma during all stages of infection determined by competitive PCR. Science 259: 1749-1754. Layne, S. P., M. J. Merges, M. Dembo, J. L. Spouge, S. R. Conley, J. P. Moore, J. L. Raina, H. Renz, H. R. Gelderblom, P. L. Nara. 1992. Factors underlying spontaneous inactivation and susceptibility to neutralization of human immunodeficiency virus. Virology 189: 695-714. Yewdell, J. W., E. Reits, J. Neefjes. 2003. Making sense of mass destruction: quantitating MHC class I antigen presentation. Nat. Rev. Immunol. 3: 952-961. Kafri, T., D. Morgan, T. Krahl, N. Sarvetnick, L. Sherman, I. Verma. 1998. Cellular immune response to adenoviral vector infected cells does not require de novo viral gene expression: implications for gene therapy. Proc. Natl. Acad. Sci. USA 95: 11377-11382. Yewdell, J. W., J. R. Bennink, Y. Hosaka. 1988. Cells process exogenous proteins for recognition by cytotoxic T lymphocytes. Science 239: 637-640. Riddell, S. R., M. Rabin, A. P. Geballe, W. J. Britt, P. D. Greenberg. 1991. Class I MHC-restricted cytotoxic T lymphocyte recognition of cells infected with human cytomegalovirus does not require endogenous viral gene expression. J. Immunol. 146: 2795-2804. Schwartz, O., V. Marechal, B. Friguet, F. Arenzana-Seisdedos, J. M. Heard. 1998. Antiviral activity of the proteasome on incoming human immunodeficiency virus type 1. J. Virol. 72: 3845-3850. Briggs, J. A., M. N. Simon, I. Gross, H. G. Krausslich, S. D. Fuller, V. M. Vogt, M. C. Johnson. 2004. The stoichiometry of Gag protein in HIV-1. Nat. Struct. Mol. Biol. 11: 672-675. Valitutti, S., S. Muller, M. Cella, E. Padovan, A. Lanzavecchia. 1995. Serial triggering of many T-cell receptors by a few peptide-MHC complexes. Nature 375: 148-151. Tsomides, T. J., A. Aldovini, R. P. Johnson, B. D. Walker, R. A. Young, H. N. Eisen. 1994. Naturally processed viral peptides recognized by cytotoxic T lymphocytes on cells chronically infected by human immunodeficiency virus type 1. J. Exp. Med. 180: 1283-1293. Lifson, J. D., M. Piatak, Jr, J. L. Rossio, J. Bess, Jr, E. Chertova, D. Schneider, R. Kiser, V. Coalter, B. Poore, R. Imming, et al 2002. Whole inactivated SIV virion vaccines with functional envelope glycoproteins: safety, immunogenicity, and activity against intrarectal challenge. J. Med. Primatol. 31: 205-216. Peyerl, F. W., H. S. Bazick, M. H. Newberg, D. H. Barouch, J. Sodroski, N. L. Letvin. 2004. Fitness costs limit viral escape from cytotoxic T lymphocytes at a structurally constrained epitope. J. Virol. 78: 13901-13910. Shiver, J. W., T. M. Fu, L. Chen, D. R. Casimiro, M. E. Davies, R. K. Evans, Z. Q. Zhang, A. J. Simon, W. L. Trigona, S. A. Dubey, et al 2002. Replication-incompetent adenoviral vaccine vector elicits effective anti-immunodeficiency-virus immunity. Nature 415: 331-335. Casimiro, D. R., F. Wang, W. A. Schleif, X. Liang, Z. Q. Zhang, T. W. Tobery, M. E. Davies, A. B. McDermott, D. H. O’Connor, A. Fridman, et al 2005. Attenuation of simian immunodeficiency virus SIVmac239 infection by prophylactic immunization with DNA and recombinant adenoviral vaccine vectors expressing Gag. J. Virol. 79: 15547-15555. Matano, T., M. Kobayashi, H. Igarashi, A. Takeda, H. Nakamura, M. Kano, C. Sugimoto, K. Mori, A. Iida, T. Hirata, et al 2004. Cytotoxic T lymphocyte-based control of simian immunodeficiency virus replication in a preclinical AIDS vaccine trial. J. Exp. Med. 199: 1709-1718. O’Doherty, U., W. J. Swiggard, M. H. Malim. 2000. Human immunodeficiency virus type 1 spinoculation enhances infection through virus binding. J. Virol. 74: 10074-10080.